"Covered everything needed, really enjoyed it. I now have a clear understanding of 3 star requirements and areas need to improve. Very clear instruction given, have improved and learned new skills." “Great explanations and directions from instructor. Techniques and procedures were explained in an easy to understand manner." "Got more from the course than expected, lots of personal care and attention given. " 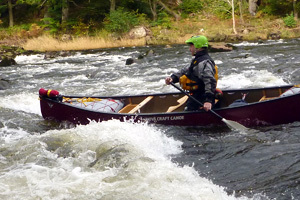 Do you want to improve your canoe paddling? 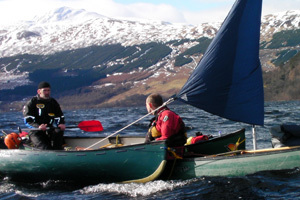 Journeying in the open canoe gives the opportunity to perfect a large variety of techniques. Develop your river reading skills and improve your boat control in white water. Develop modern efficient forward paddling techniques and an understanding of trim adjustment to allow you to paddle for longer in windy conditions on open water. Help you get the most from the outfitting of your boat. Develop your understanding of the traditional skills such as poling or rope work. Give you some advanced rope work skills to help get that expensive boat off the rock. On our intermediate course we will take you to wherever you are comfortable and challenge you to improve your skills. Our highly qualified and experienced staff will push you at the pace that suits you and prepare you for a higher level of challenge as the course goes on. Working with small student numbers these courses are tailored to the needs of the individual within the group. 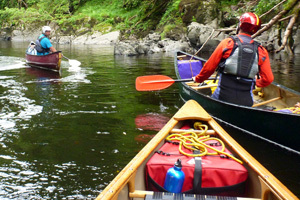 Sample itinerary are listed below but please note that this course is very adaptable..
A canoe that is fitted out for the environment that has enough buoyancy. A paddle, helmet and buoyancy aid suitable for white water. Sturdy footwear and appropriate clothing such as drysuit and thermals or separates. You will also need a hot drink and lunch that you can carry on the river if necessary. If you don’t have all of the above equipment please contact us as we may be able to help with this. Cumbrian venues for this could include the large lakes of Ullswater and Windermere. Rivers such as Leven, Greta, Lune, Duddon, Lower Kent.